Chief Minister Prem Kumar Dhumal said that Centre Government had been adopting discriminatory approach towards the State of Himachal Pradesh by ignoring its developmental needs. He was speaking in the BJP ruled States Chief Ministers Conference at New Delhi today. Prof. Dhumal said that the Centre Government failed to provide the legitimate share of 7.19 percent to State from Bhakra Beas Management Board (BBMB) despite the verdict of Hon’ble Supreme Court in this regard and added that a sum of Rs. 4000 crore due of the State was still pending. He said that the State was being denied the financial assistance in centrally sponsored schemes on 90:10 ratio as being given to North Eastern States. Chief Minister said that the ration quota being provided to the State was insufficient and added that the proposal of State Government for sanctioning five new National Highways was still pending. He said that the NDA Government had sanctioned Industrial package for the State upto 31 March, 2013 but the UPA Government had reduced it to 31 March, 2010. He said that the State incurred losses worth Rs. 10,725 crore due to wrong assessment of assets and liabilities by 13th Finance Commission and the allocation to the State was only 50 percent more than the allocation of 12th Finance Commission whereas there was 126 percent average enhancement in the case of other States. He said that the work on Hydel Power Projects in the State was getting prolonged due to delay in approvals and clearances from Forest and Environment. He said that the per capita income of the State had increased from Rs. 43,966 in 2007-08 to Rs. 65,535 in 2010-11 and an estimated Rs. 73,608 in 2011-12 which was 20 percent more than the National average. He said that the average economic growth of the State during last four years was 8.3 percent and the State GDP in 2007-08 was Rs.33,963 crore which had increased to Rs.63,084 crore in 2011-12. He said that 12,000 eligible persons were benefited through Chief Minister Relief fund by providing Rs. 24 crore as assistance. Prof. Dhumal said that one lakh employment avenues were created in private and power sectors in order to boost Industrialization in the State whereas 40 thousand educated youth were provided employment in Government sector. He said that a special subsidy of Rs. 150 crore was provided by the State Government to provide relief to common man facing rising prices under which essential commodities were being provided to 16.31 lakh ration card holders. He said that benefits worth Rs. 31,500 were provided to every single family besides benefits worth Rs. 54,000 to BPL families during last four and a half years. Chief Minister said that mere 6393 MW power capacity had been harnessed during last 4 decades out of the total capacity of 23000 MW and added that 9152 MW additional Power had been harnessed during last 4 years by the present Government. Prof. Dhumal said that Rs. 65 crore Atal School Uniform Yojna had been started from this year under which all students from first to 10th standard were being given free uniform twice in a year and 9,28,365 uniforms had already been distributed in the first phase. He said that 2,35,131 people had been registered under Rashtriya Swasthya Bima Yojna. He said that 2.25 lakh people in the State had been benefited under Atal Swasthya Sewa Yojna adding that 135 ambulances were providing twenty four hours service under the scheme. Chief Minister said that under Atal Bijli Bachat Yojna four CFL had been given to each electricity consumer free of cost by the Government by spending Rs. 65 crore resulting in saving of Rs. 110 crore annually and saved 270 MU of electricity. 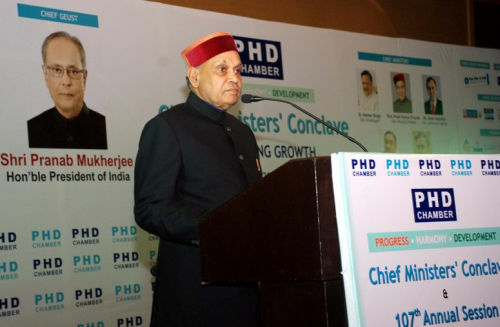 Prof. Dhumal said that Himachal Pradesh was the first State of the Country where 90 percent of drinking water was being supplied through pipe lines and 27,047 hand pumps had been installed in the State till date out of which 12,345 hand pumps had been installed besides irrigation facility provided to 29,358 hectare additional land by the present Government. Chief Minister said that one Certification Agency was being established in the State to promote organic farming. He said that Rs. 321 crore Crop Diversification Scheme was being implemented in the State under which organic farming and production of vegetables was being encouraged. He said that Rs. 353 crore, Pandit Deen Dayal Kishan Bagwan Samridhi Yojna was being implemented in the State under which 12500 Poly Houses had been set-up and production of vegetables increased to 100 metric tonne per hectare.